Kayak & Raft | KUMSHEEN | Raft. Relax. Recharge. Adventurers looking for the most ‘extreme’ Kumsheen weekend experience will love this trip. 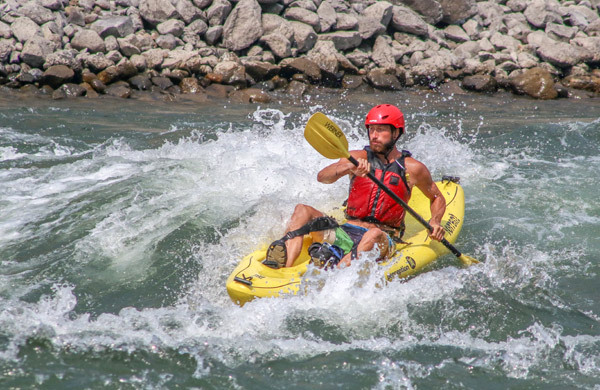 We combine a full-day on the Legendary Thompson River (Power or Paddle) with a day of sit-on-top kayaking, all based from the Kumsheen resort. DAY ONE – The Legendary Thompson River (Paddle or Power). This trip has it all – 40km, 25 rapids (class III/IV), 6hrs, and an amazing riverside lunch at Kumsheen’s Nicomen Falls property. DAY TWO – Kayaking. This is for true adventure seekers, looking to immerse themselves in epic BC white water. This is also a full-day trip, including a packed lunch. Learn to navigate/paddle through white water, to self-rescue, and to get pounded by waves with a smile on your face. TRIP LENGTH – Day One – 40km/6hrs, Day Two – 30km/7hrs. ACCOMMODATIONS – Includes 2 Nights of Camping. Upgrades Available. **You must be a very competent swimmer, have no fear of water, and be in a good physical condition in order to participate in this tour.